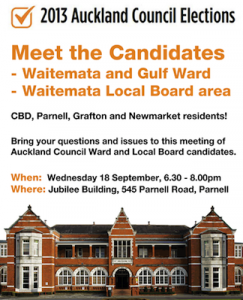 Candidates for Auckland’s Waitemata and Gulf Ward will answer questions from local voters on Wednesday, 18 Septemb er at a Meet the Candidates event to be held at the Jubilee Building, 545 Parnell Road, Parnell from 6.30pm to 8.00pm. Positions will be hotly contested. 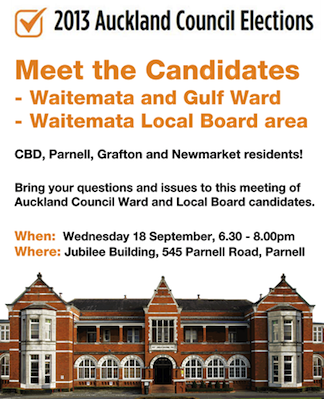 Up for grabs are one Auckland Council seat and seven positions on the Waitemata Local Board. Local residents are encouraged to attend the meeting, which will provide an ideal opportunity to ask questions and discuss key issues with candidates. The meeting has been co-ordinated by a number of local groups: Parnell Trust, Grafton Residents Association, Newmarket Community Association, Parnell Community Committee, Auckland CBD Residents Advisory Group and Parnell Heritage.